Ok, thanks Trina) – the WSJ had a 3-D manufacturing section last week – incredibly inspiring articles about the 3-D printing. The growth of these facilities has come in tandem with the rise of America’s “maker” movement, a subculture of do-it-yourselfers who make everything from drone planes to sculptures. New facilities let entrepreneurs create physical products at speeds and costs that were once unthinkable. Many of these tinkerers are now starting businesses. “It’s easier and cheaper now to prototype and get from production volumes of tens of units to hundreds or thousands of units,” says Rob Coneybeer, managing director of venture-capital firm Shasta Ventures. Thanks, too, to improvements in wireless technology, microprocessors and battery power, venture capitalists are looking to invest in hardware startups. 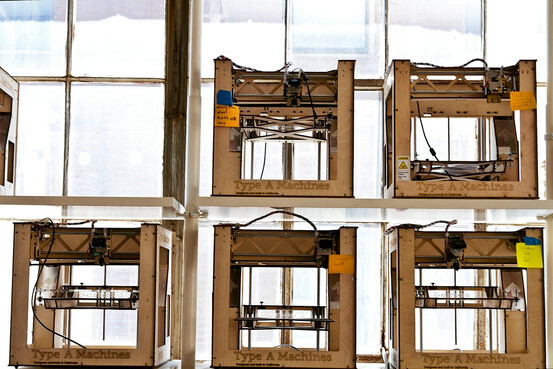 TechShop’s machines include 3-D printers. TechShop, based in Menlo Park, Calif., has been at the forefront of this trend. The company was founded 6½ years ago by inventor Jim Newton, who had a thick notebook of some 200 product ideas and wanted access to the tools to make them. TechShop has helped produce prototypes and early production lines for dozens of hardware companies, including Square Inc., a credit-card processing service that makes a small device that attaches to smartphones and tablets, and Type A Machines, which sells $1,400 3-D printers and is currently raising funding. A company called Prototank has set up an office in TechShop’s San Francisco facility to help other companies develop prototypes, as well as work on its own projects, including lamps and electric signs.